Our last full day in Victoria and on Vancouver Island so we made a visit to the Parliament Buildings. 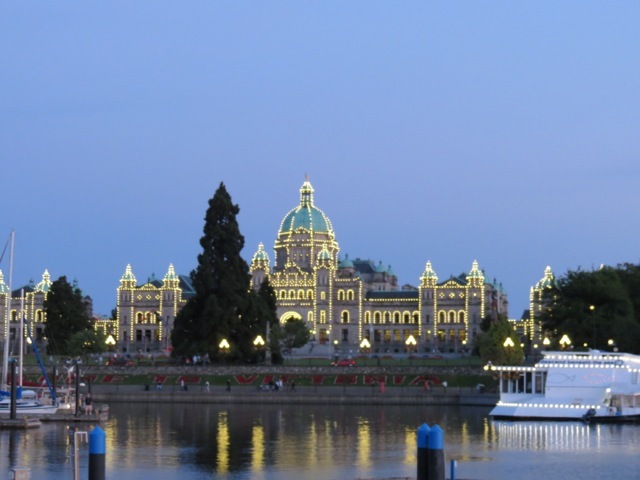 It is a lovely building, home to the Legislative Assembly of British Columbia, and built in 1898. The building was designed by a 25 year old English immigrant and as we looked around the building an actor playing him started shouting about how disappointed he was that the building had been made more practical. The girls watched fascinated as he was in period dress, until he stomped his foot and shouted close to where the Big One was standing. This was our cue to leave as the girls were then too scared to stay! 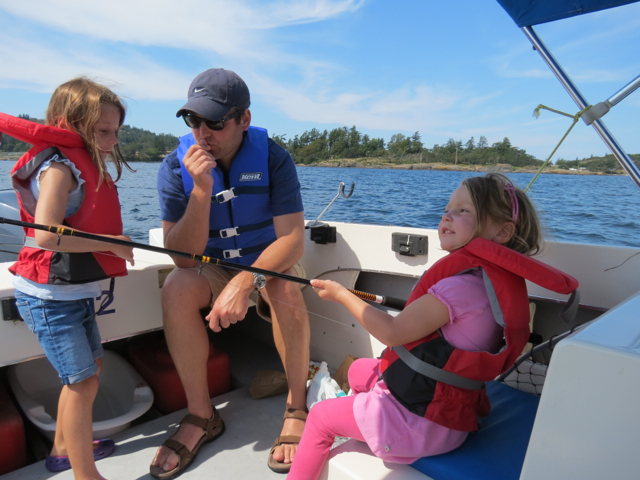 We grabbed some lunch and drove to a beautiful inlet half an hour away from Victoria where we hired a motor boat at the Peddar Marina. 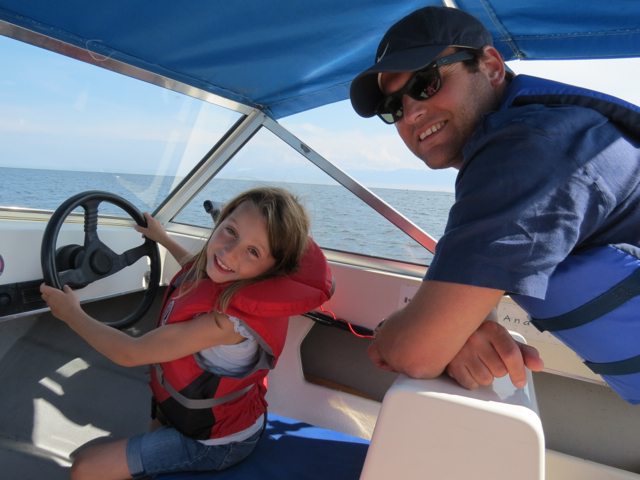 The boat was big enough for 6, so the perfect size for us, all our stuff and a fishing rod that we hired. We love floating around on the water and as the inlet came a long way inland there were hardly any waves, which was good after the whale watching experience last week! 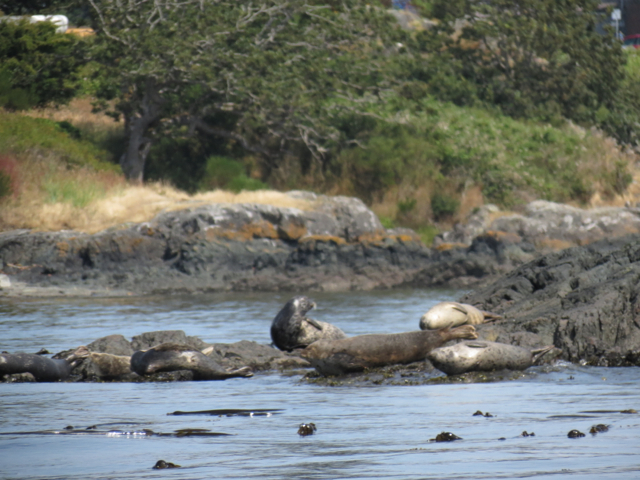 We saw some more seals hanging out on some rocks and a couple at the marina waiting for any extra fish the fishermen might discard. We tried fishing. The girls loved rocking in the boat whilst waiting for a fish to bite but the fish weren’t interested and the girls lost patience after about 20 minutes. This was a good thing as we’d got the line in a tangle anyway! A spot of fishing before the line got into a tangle! 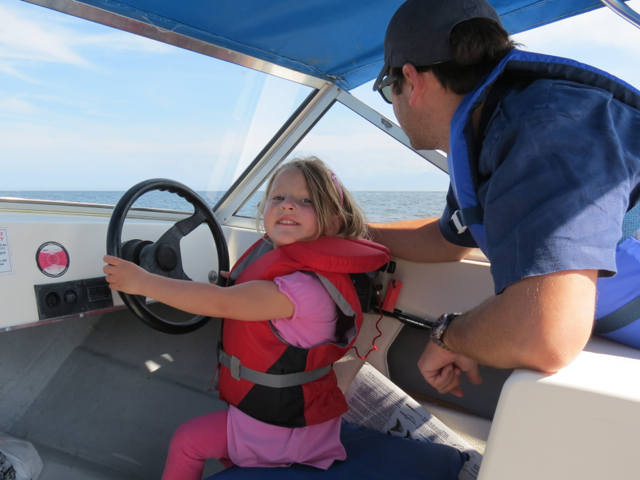 The Little One became an expert at going around in very tight circles (a bit like a car doing donuts in a car park…) and the Big One was managing the steering and throttle completely by herself and was even standing up when the boat was going fast so she could see over the front properly! We spent a lovely 3 hours pottering around before heading back to Victoria for dinner at a great Chinese restaurant called the Hope Key. The owner was lovely and didn’t stop chatting to us the entire meal!